The second-year running back scored his third touchdown of the season on a 44-yard swing pass from Philip Rivers to lead the Chargers to a 26-10 victory over the Oakland Raiders on Sunday. Ekeler, signed as an undrafted free agent in 2017, made two Oakland defenders miss at the Raiders 40, got a block from Keenan Allen and then went up the left sideline, putting the Chargers ahead for good. Ekeler has 410 yards from scrimmage, with 207 coming via receptions. He has six touchdowns in his career and is three away from tying Dan Reeves for most TD catches by an undrafted player in his first two years in the league. Reeves had nine with Dallas 1965-66. Ekeler and Gordon are averaging 201 yards from scrimmage for the Chargers. Gordon is third among NFL running backs at 119 yards per game, and Ekeler is 12th at 82. Gordon had 120 yards from scrimmage against the Raiders (58 rushing, 62 receiving), including a 1-yard touchdown run in the second quarter to put the Chargers up 17-3. Rivers was 22 of 27 for 339 yards with two touchdowns and a 143.4 passer rating. He completed passes to seven players, but as he noted, no one had a big yardage day. The Chargers signed punter Donnie Jones last Tuesday to also be the holder on field goals and extra points, thinking that it would help solve Caleb Sturgis‘ struggles. If the results of one game are any indication, it hasn’t. Sturgis made two field goals, but he also missed his fourth extra point of the season and was wide left on a 48-yard attempt on the last play of the first half. The sixth-year kicker has missed four extra points this season, equaling the amount he had over three seasons in Philadelphia from 2015-17. The Raiders had a pair of rookie tackles starting in a game for the first time since the 1970 merger, with Kolton Miller at left tackle and Brandon Parker on the right side. Oakland allowed three sacks, but quarterback Derek Carr wasn’t ready to single them out. Oakland was putting together a nice drive during the third quarter and got to the Chargers’ 1 before Derek Carr threw an interception to Melvin Imgram in the end zone. A touchdown would have brought the Raiders within 10 with 1:05 remaining in the third quarter, but it basically ended all hopes for a comeback. Carr has more interceptions (eight) than touchdowns (seven) after the first five games in Gruden’s offense. Gruden says that the fifth-year quarterback is progressing, but Carr admitted after the game that he needs to quit pressing. Both teams have “home” games at London’s Wembley Stadium the next two weeks. 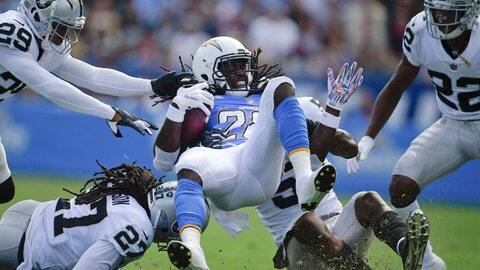 The Raiders will face the Seattle Seahawks next Sunday, while the Chargers take on the Tennessee Titans on Oct. 21. Oakland will practice at its facility before flying to London later in the week. Los Angeles will stay in Cleveland for four days after facing the Browns next Sunday before making the trip abroad.